Ultimate Embroidery & Multi-Decoration Software for professional digitizers, embroidery shops, industry trainers and educators, and apparel decorators. With new technical and creative stitching effects, even faster digitizing and over 200 professional embroidery fonts, you can digitize more creative advanced designs quickly with full professional control. Kiosk Mode – Ultra simple personalised designs for retail shops. 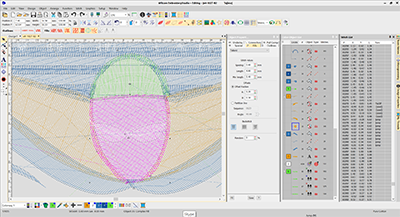 Freehand – Integrated freehand drawing of stitched outlines and fills plus selected details from other elements are now also included. Editing, Monogramming, Lettering and Machine Connection Software Combine all the features of EmbroideryStudio Lettering with advanced embroidery editing capabilities. This provides powerful software for non-digitizing staff in a custom embroidery shop or production facility. Lettering, Monogramming, Customizing and Machine Connection Software Powerful automatic lettering, customizing and machine connection software for non-digitizing staff in a retail embroidery shop or production facility. With full professional control of all lettering and stitch settings, over 200 digitized embroidery fonts and automatic stitching of TrueType and OpenType fonts, create professional quality naming and lettering designs quickly and easily without the need for a digitizer.